Spirit of Uganda's Betty Nakato performs in one of the dance troupe's shows. The troupe will perform Sunday, April 1, at the Quick Center. Fairfield University's Regina A. 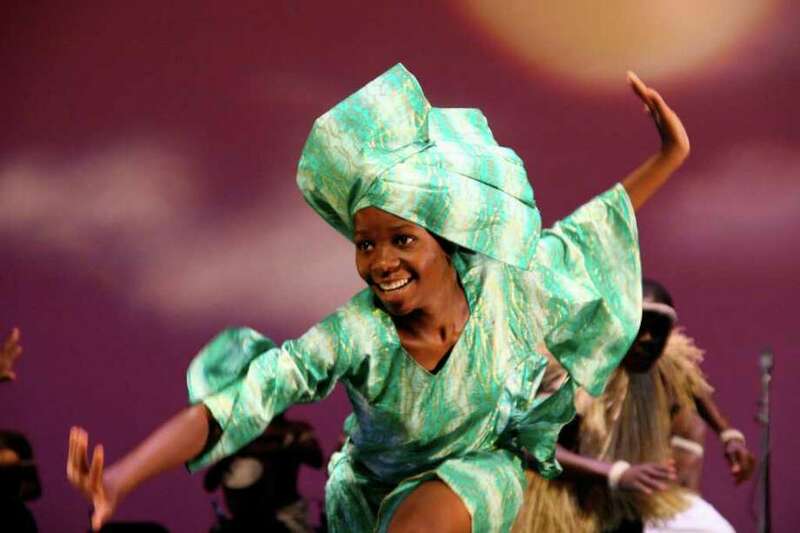 Quick Center for the Arts will present a performance by dance troupe Spirit of Uganda 1 p.m. Sunday, April 1, at the center, 1073 North Benson Road. The troupe, serving as an ambassador for Uganda's 2.5 million orphans of HIV/AIDS or victims of civil strife and poverty, will present a show with dramatic choreography, colorful costumes and traditional instrumentation. Wearing costumes inspired by traditional and modern Ugandan textiles and patterns, the ensemble will perform a repertoire with such pieces as the "Hurira Engoma," a bravura showcase with girls balancing clay pots on their heads, and "Larakaraka," an Acholi dance from northern Uganda. Another piece, "Ekitaguriro," is from the nomadic Banyankole of western Uganda, who cherish their cattle that they tend to for a living. The troupe consists of 22 young Ugandan artists ranging in age from 11 to 22 whose performances, educational activities and community exchanges promote East African culture and raise awareness to help prepare these individuals to assume leadership roles in their communities, according to a university news release. The troupe has been invited to perform at leading performing arts centers around the United States since 2007 and its Fairfield appearance is part of a national 23-city tour. Tickets, at $15 for adults and $12 for children, are available through the Quick Center Box Office at 203-254-4010 or online at www.quickcenter.com.